Back when I was editor of the Ventura County Reporter and still penning (or is it "keying") the Fir & Main blog, I wrote enthusiastically about the possibility of mass transit options linking to Dodger Stadium. 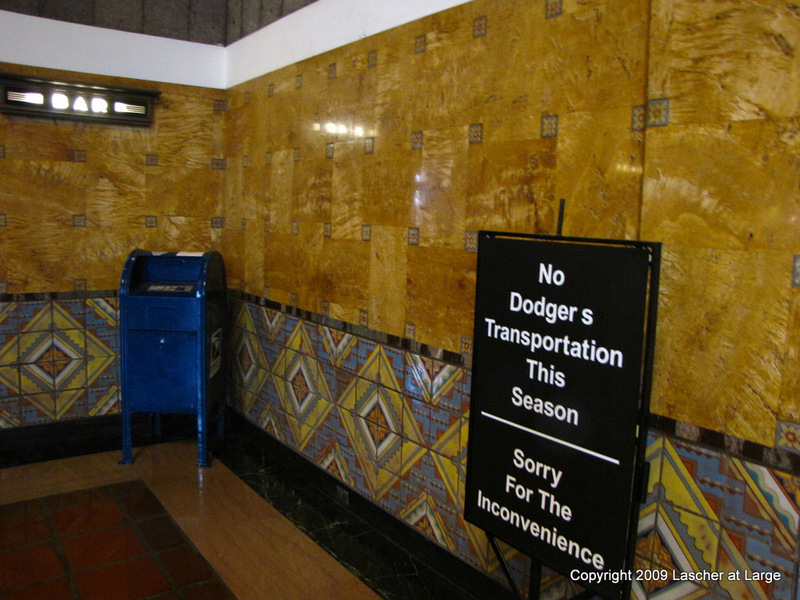 As the Dodgers fans and Angelenos reading this site know, later in the 2008 season the City of Los Angeles paid for a free shuttle service linking Dodger Stadium to Union Station. This allowed riders of multiple transit services -- particularly Metro's Red and Purple Line subways -- to easily make it to Chavez Ravine without a car to watch the boys in blue. Sadly, as these same observers also understand, the Dodgers refused to help pay for the service for the 2009 season. Now, the best way to get to Dodger Stadium by public transit remains taking the #2 or #4 bus along Sunset and hike up Elysian Park Ave. This week, a number of local media outlets have noted that the Dodgers are allowing visitors to park for free at the stadium from June 16-18 while Joe Torre's squad faces off against the Oakland Athletics. Meanwhile, some of those who do choose to drive to Dodger stadium have made a habit of avoiding parking there, both to avoid the $15 parking fee and the headaches of trying to get in and out of the stadium on game days. Some lucky souls park right on Sunset while spaces are still available. Others park along nearby Lilac Terrace, Douglas St. or Sutherland St., or even put their faith in their parking brakes as they find a spot along the ridiculously steep Quintero St. (being that this is the direction from which I approach the stadium even if I take the bus -- now that there's no trolley from Union Station -- I don't know the situation in Chinatown or other neighborhoods east of the stadium). In recent weeks, though, most of these options haven't been available to most Dodgers fans. Signs reading "local access only" have popped up at the entrance to every street on the north side of Sunset between Lilac and Portia Street. Responding to inquiries I made June 9, Julie Wong, L.A. City Councilmember Eric Garcetti's communications director, and Monica Valencia, councilmember Ed Reyes' Press Deputy told me that the signs were a result of "concerns we heard from the Elysian Park Task Force and meetings with local residents who asked for assistance with alleviating activity such as speeding, drunk and disorderly conduct by people leaving Dodger Stadium, and tailgate parties on the street in front of residences -- complete with blaring speakers and beer kegs." Garcetti's 13th district includes Douglas, Quintero and Sutherland streets. Lilac Terrace is within Reyes' District 1. The Dodgers paid for the signs and their installation on the three streets within Garcetti's district. Councilmember Reyes' provided the sign on Lilac. The city is not incurring any additional parking enforcement costs on gamedays, Wong and Valencia's said in their email. Not counting paying up and parking in the ravine, this leaves four options for Dodgers fans: access the stadium from a different entrance (thus promoting extra fuel burning and increased congestion), park further away from the stadium and walk further (thus moving the problems residents complain of to other neighborhoods), take the aforementioned buses and walk or bike to the gate (thus further underscoring the need for a trolley to shift demands on already pack Metro buses), or bike the entire way to the stadium (which isn't the easiest task -- and not because of pedaling up so many hills). While I didn't inquire as to the cost of the no-parking signs, I imagine they cost less than the few hundred thousand dollars the Dodgers Trolley was expected to cost before this season began, let alone how much it would cost to pay for an abbreviated schedule. Still, with the Dodgers saving a significant chunk of change after Manny Ramirez's 50-game suspension -- albeit money that probably cannot easily be transferred from payroll to other needs -- it's inexplicable that the Dodgers resist supporting access to Los Angeles' baseball team. Of course, I can only imagine that the team was all too happy to oblige the city in restricting access for drivers to streets surrounding Dodger Stadium. Sadly, as long as transit options to the stadium remain so limited most of these drivers are likely to pay the $15 (or just stay home, turn on the TV and listen to Mr. L.A., Vin Scully, wishing he would call the entire game on the radio too). I love the Dodgers. I have since as long as I can remember. When I was in 3rd grade I even dressed up as Orel Hershiser for Halloween right after the 1988 World Series. But that doesn't excuse the Dodgers for not taking sincere efforts to make the Dodger Stadium experience a more inclusive, accessible one. Such an action would be a far more effective, neighborly and community-minded (not to mention green) action than renaming the neighborhood Dodgertown and giving it its own zip-code. More importantly, perhaps, at least from the Dodgers' point of view, it would pay off with committed fans ready to spend more on tickets and food and drinks at the stadium. Newer PostWill Going Green be the Next Way We Go Bust?